In this example I'm playing an E7b9 at the open position then going to an inversion of the same chord before resolving on an A minor. To get the inversion you simply move the shape ( shown below ) up three frets - leaving the open strings open. 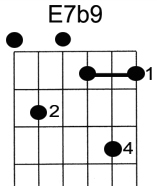 This works like a diminished chord in that you could keep going up three frets at a time and it is still the same chord as long as you have the open E note at the bottom.